LEOSU Washington DC -The District of Columbia’s largest 9(b)3 Security Union for Law Enforcement, Special Police Officers, Protective Service Officers, Federal Contract Guards & Campus Police Officers serving Washington DC Capitol Region. The Law Enforcement Officers Security Unions (LEOSU – DC) Washington DC is a full service labor organization formed to provide every labor related service from negotiations, grievance processing, legal and legislative representation. The Law Enforcement Officers Security Unions (LEOSU-DC) Washington DC mission is to serve as a voice for law enforcement officers and security professionals in Washington DC Region to their employers. Thousands of law enforcement officers and security professionals provide a fundamental protective service to federal agencies as contractors. These bargaining unit employees need to have their workplace concerns and interests represented to their employer with passion, integrity, and fairness. LEOSU-DC delivers a comprehensive employee and labor relations program that will provide high quality service to officers by representing their interests and negotiating with the employer for results that create a better workplace. Our union is characterized by three core values: personalized service, transparency, and results. The number one issue that LEOSU-DC representatives address when speaking with groups interested in switching union affiliation is the quality of our negotiators, business agents and the service they provide to their local units. Calls are returned promptly. Many questions are answered on the spot, more difficult inquiries are responded to immediately after the issue is investigated. Our partnership agreements with other 9(b)(3) Security Guard, Security Police, Law Enforcement Unions & Security Training facilities benefit from the expertise and assistance of these International Unions, National Unions, its divisions and affiliate partners within the Union’s structure makes us one of the strongest 9(b)(3) security unions in Northeast and the United States. Law Enforcement Officers Security Unions (LEOSU-DC) America’s fastest growing 9(b)3 Security Union For Law Enforcement Security Police, Special Police, Security Guards, Security Officers & Security Professionals in New York, New Jersey, Connecticut, Washington DC Capitol Region and throughout the Northeast. Memorial Service held to remember security guard Idrissa Camara killed in Manhattan shooting. NEW YORK –More than 200 people gathered to honor a security guard who was gunned down at a federal office building in Manhattan by a former government employee who later killed himself. 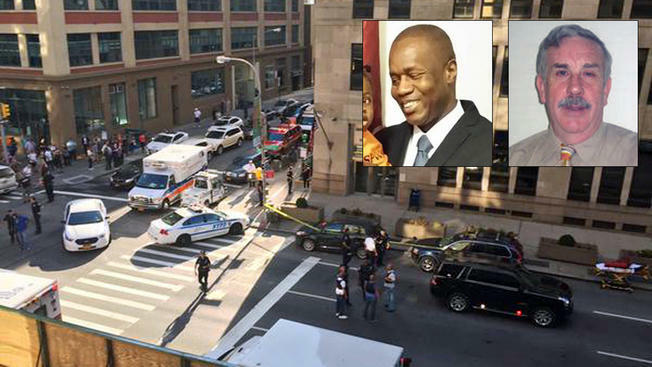 The Federal Protective Service held a memorial Thursday night in Manhattan to remember Idrissa Camara. The 53-year-old was working for FJC Security Services at a federal office building on Varick Street on Aug. 2. Posted by Unions For Security Guards - Security Guard Unions in NYC Security Guard Shot and Killed at 201 Varick St at Houston Street. 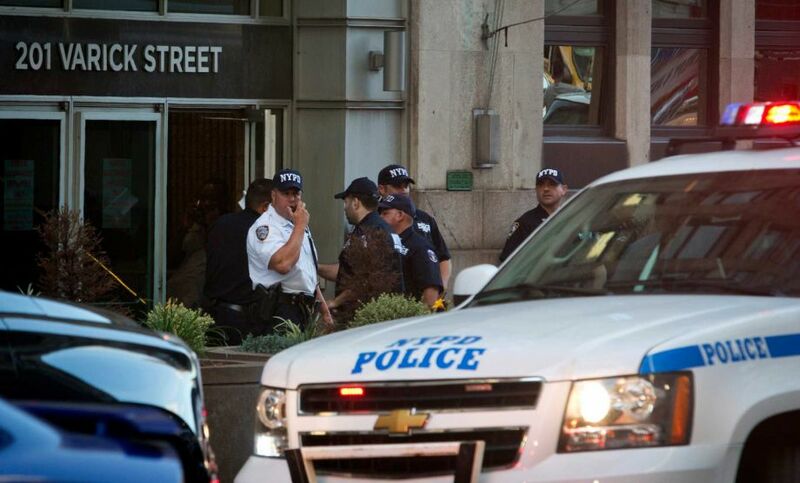 NEW YORK, Aug 21 (Reuters) – A gunman opened fire at a federal building in Lower Manhattan on Friday, fatally wounding a FJC security guard before killing himself, officials said. The suspect entered the building just after 5 p.m. and immediately shot the guard with a handgun, police said. He then walked further into the building toward an elevator when he encountered another employee, said James O’Neill, chief of department for the New York Police Department. The gunman then shot himself in the head. A police official identified the gunman as Kevin Downing, a man in his late 60s from Fort Lee, New Jersey, according to media reports. The 68-year-old suspect walked into the building and approached the metal detector at the security screening area, NYPD Chief of Department James O’Neill said. The suspect then pulled out a gun and shot thesecurity guard in the head, officials said. PHOTO: Aerial scene of a shooting at 201 Varick St. in New York City, Aug. 21, 2015. (WABC). 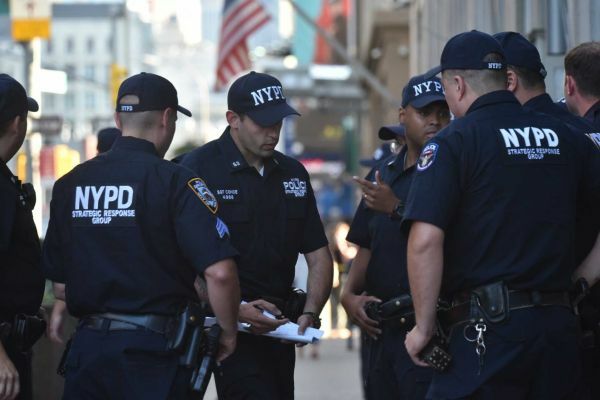 NEW YORK (AP) — Police say a man has walked into a federal building in New York City and opened fire, wounding a security guard before shooting himself. A security guard protecting a federal building in lower Manhattan was fatally shot Friday evening by a gunman, who then took his own life, authorities said. “The suspect is dead at the scene,” NYPD Chief of Department James P. O’Neill said at the scene. A gunman charged into a federal building in Manhattan’s West Village neighborhood near SoHo on Friday, reportedly killing a private security guard and shutting down streets in the area as squad cars and other emergency personnel rushed to the scene. One of the people who was shot was a security officer at the building, the Wall Street Journal reported, citing an unnamed law-enforcement official. The suspect in the shooting is believed to have then committed suicide with the same weapon, it said. There are no other suspects being sought. We will hold a press briefing momentarily. There was a shooting at a federal building at 201 Varick Street. One victim shot, suspect dead on scene. Our Prayers go out to the FJC Security Guard killed senselessly today in Lower Manhattan and also to his family.